This model fits 4″ K, L N-or even the huge X Frame design. 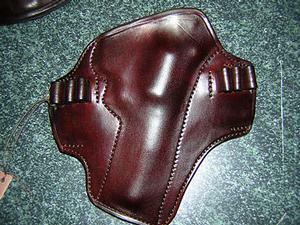 This is the new Texas Pancake™ Holster Designed in Alaska for a customer in the southwest. It is very comfortable, carries the gun close, and conceals well even with the cartridge loops. The Texas Pancake™ comes with 2 tunnel loops sewn into the back of the holster. Width: Up to 1.75." 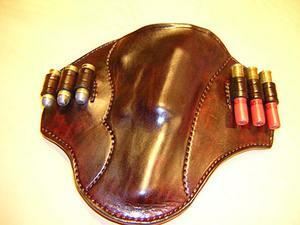 To view guns we can make this holster for click here to view gun chart. Note: Black & Celtic Knot work Or floral are not a good combo. Oxblood or tan are a better choice.